The previously referenced video on SNClocks.com shows using the tip of a tooth-pick to apply flux and a chip of solder. It also shows the flux boiling off and the solder flowing into place. As you watch the video you will see that the flux boils when heated. This will sometimes result in the solder bounced off of the work piece, or, as shown in the video, moving the reinforcing washer off of center. I minimize the impact of the boiling flux by heating very gently until the flux is all evaporated. And then I continue to heat very gently until the solder melts. 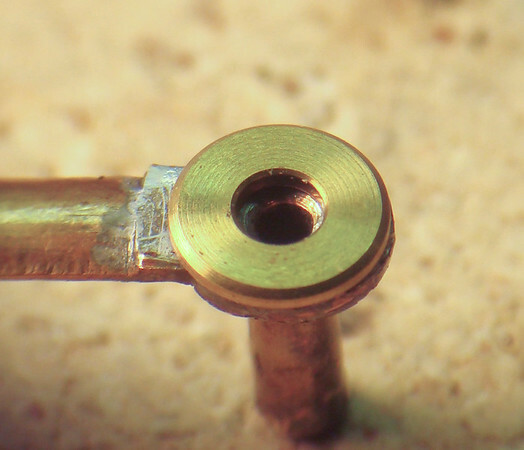 The boiling flux shown in the video did not cause concern while soldering because the solder, when it melted, has enough surface tension to pull the washer back to a centered position. If it is necessary to move a part after it is soldered I will typically reheat gently, and, when the solder has just melted, I will use the tip of a toothpick to realign pieces. Small butane torches are very effective for this kind or repair. It is important, even with a very small torch, to not apply the flame directly to the point being soldered, since this will likely just blow the chip of solder off the workpiece. It is most effective to heat the larger piece being soldered, applying the heat a short distance from the joint, and letting the heat flow through the workpiece to first boil off the excess flux, and then melt the solder. It is also important that the heat be withdrawn as soon as the solder has melted. There is no benefit to overheating a workpiece after the solder has flowed – and overheating will soften steel and brass.